New York Senator Chuck Schumer is the latest politician to speak out against a proposed trash incinerator in the town of Romulus on Seneca Lake. Vineyard slopes down to Seneca Lake. The railroad that would carry trash to the proposed incinerator would pass along the shore seen here. Photo credit: Celia Clarke/WSKG. Many residents, business owners and local lawmakers opposed the project and have proposed legislation to block it. 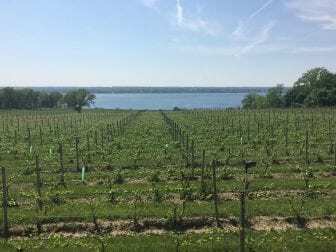 Speaking at a vineyard along the shore of Seneca Lake Friday, Schumer criticized the project. The Senator gave two reasons for his involvement in the issue. First, he is one of the stakeholders listed on the company’s application for a state permit. This means he’s allowed to express his opinion of the project to the utility siting board. He promised to use his clout to influence the board. Also, if the project gets a state permit, Schumer said, it would still require a federal Clean Air permit. If it comes to that, “we’ll fight that way, too. We’ll do everything we can to fight this plan,” said Schumer. Those present included local opponents, local officials from Romulus, Ithaca and nearby counties and state senator Pam Helming (R,C,IP-Canandaigua) who has sponsored legislation to change state law to exclude incinerators from the expedited utility siting process. Governor Andrew Cuomo recently released a statement, also opposing the project.